The James E. Foy V-ODK Sportsmanship Trophy—say that three times real fast—is coming home tonight on the wings of Chris Davis (PLEASE BE THE CELEBRITY N). Win the Iron Bowl, win the trophy. It’s a tradition. Has been for a while. 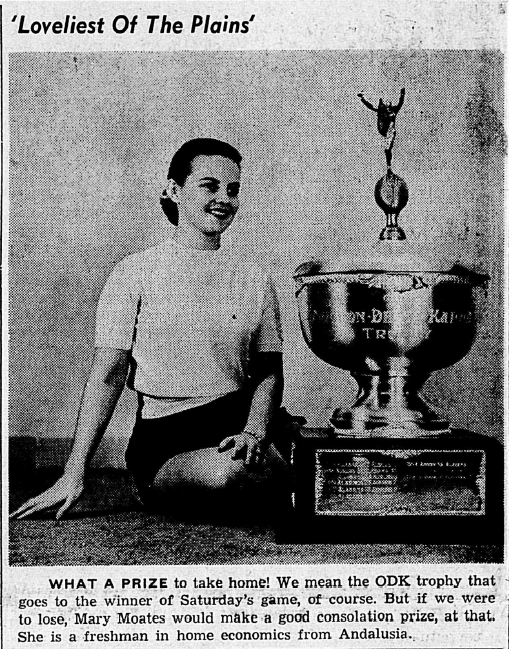 Here’s it is in 1957, just before Auburn earned it the most it ever had or has (points-wise). The trophy is on the right. Previously: Loveliest of the Plains: Lynn Monroe roasting by an open fire.